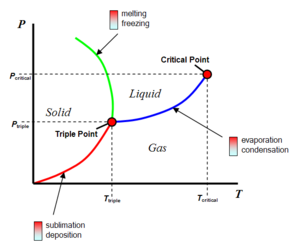 The phase diagram for water, clearly displaying water's triple point. The transition between solid to gas is known as sublimation. Sublimation is the phase transition between solid and gas, without an itermediate liquid phase. 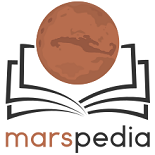 As the pressure and temperature of Mars is very low, water on the surface can only exist as ice or water vapour. In the phase diagram for water on Mars, temperatures and atmospheric pressure are below the triple point. Sublimation occurs when ice is heated. A terrestrial example of sublimation is if "dry ice" (solid CO2) is exposed to air at one atmosphere. The ice will turn into a gas and appear to steam without passing through a liquid phase. The opposite to sublimation is deposition, where water vapour is cooled and deposited as ice. An example of deposition is terrestrial frost, where water vapour (during winter) becomes very cold, bypassing the liquid (rain) phase. Some other examples of ice sublimated are snow slowly disappearing even in low temperatures. In addition, if ice cubes are left in ice trays for a long time in a refrigerator, they can be observed to get smaller and smaller until they disappear. This is an example of sublimation. Naphthalene, an organic compound commonly found in mothballs, sublimes easily because it is made of non-polar molecules that are held together only by weak intermolecular forces (Van der Waals). The element Iodine sublimates easily. Often iodine crystals are found on the top lid of a bottle of iodine. The iodine sublimates from crystals at the bottom of the bottle and then are deposited on the top. So the iodine seems to go right through the air. In a way it’s like the transporter on board the Starship Enterprise—matter is transported from one place to another. During the Martian winter CO2 frost is deposited at the winter pole. During the Martian summer CO2 ice sublimes from the summer pole. The amount of solid carbon dioxide involved is enormous at least 12-16 % of the atmosphere is deposited and removed each Martian year. This process causes great pressure changes and high winds. Sublimation of water ice and dry ice cause many interesting landscape features on Mars. For examples of these forms go to Sublimation landscapes on Mars. ↑ Heimler, C., J. Price. 1987. Focus on Physical Science. Merrill. Columbus. ↑ NASA/Goddard Space Flight Center. "New gravity map gives best view yet inside Mars." ScienceDaily. ScienceDaily, 21 March 2016. This page was last edited on 8 February 2019, at 17:15.